The Federal Reserve meeting ended Wednesday afternoon and stocks rallied significantly, but super regional banks, such as BB&T Corp. (BBT - Get Report) , M&T Bank Corp. (MTB - Get Report) , PNC Financial Services Group Inc. (PNC - Get Report) , SunTrust Banks Inc. (STI - Get Report) and U.S. Bancorp (USB - Get Report) , stalled. If you bought the big banks near their Christmas lows, it's time to book trading gains now! It appears that the FOMC has put a halt to raising the federal funds rate indicating that the current rate of 2.25% to 2.50% is neutral. In addition, they announced that the unwinding of their huge balance sheet could be slowed or even reversed as an important tool of monetary policy. All five regional banks have solid gains off their Christmas lows, with BBT, M&T and STI in bull market territory. Even so, all five are still in correction territory since setting their 2018 highs between January and July with PNC in bear market territory. What continues to spook bank stocks is the "text book" notion that banks always benefit when the FOMC hikes rates. This does not work when many banks stretch for riskier interest-baring assets against short-term funds, giving them risks that the Federal Deposit Insurance Corporation is worried about. Another concern is that as the Federal Reserve unwinds its balance sheet, money is drained from the banking system, which hurts bank liquidity. As of Jan. 23, the balance sheet was marked at $4.047 trillion down $453 billion since the end of September 2017 when it was $4.5 trillion. The first drain of 2019 was just $2 billion, the second was $6 billion and the latest was $3 billion. The total for January is now just $11 billion. With the December drain of $30 billion instead of $50 billion I knew that the FOMC would offer new unwinding guidance following Wednesday's policy meeting. The daily chart for BBT shows that the stock ended 2018 at $43.32, which was the input to my proprietary analytics. This resulted in four horizontal lines that are my monthly value level at $45.17, my quarterly and semiannual pivots at $47.30 and $48.42, respectively, and my annual risky level at $51.83. 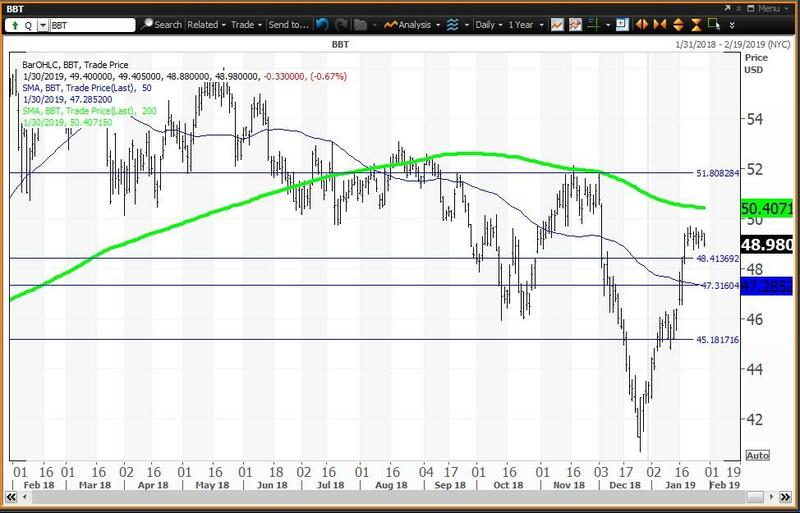 Notice how the stock stalled between its semiannual pivot of $48.42 and its 200-day simple moving average of $50.41 where profits should be taken. The daily chart for M&T shows that the stock ended 2018 at $143.13, which was the input to my proprietary analytics. 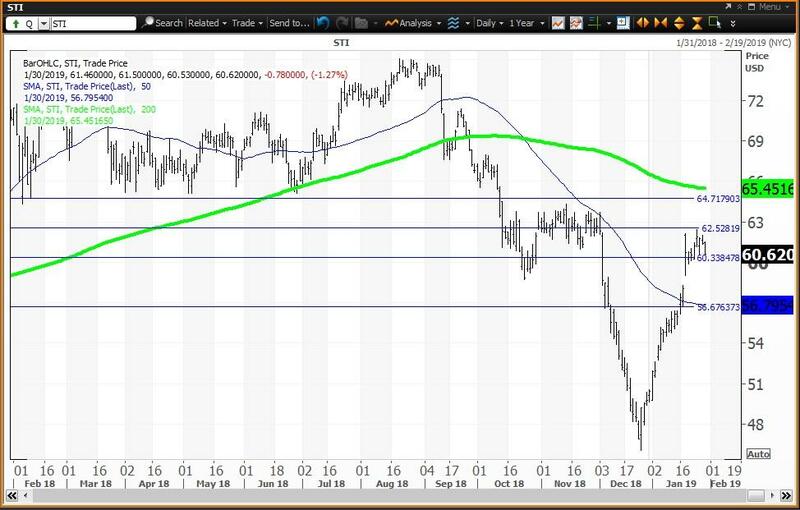 This resulted in three horizontal lines that are my monthly value level at $146.16, my quarterly and semiannual pivots converged as the second line at $166.69 and $165.53, respectively, and my annual risky level at $168.89. Notice that the stock traded as high as $169.81 on Jan. 25, an opportunity to book profits at my annual risky level of $168.89, which lines up with the 200-day simple moving average of $168.90. 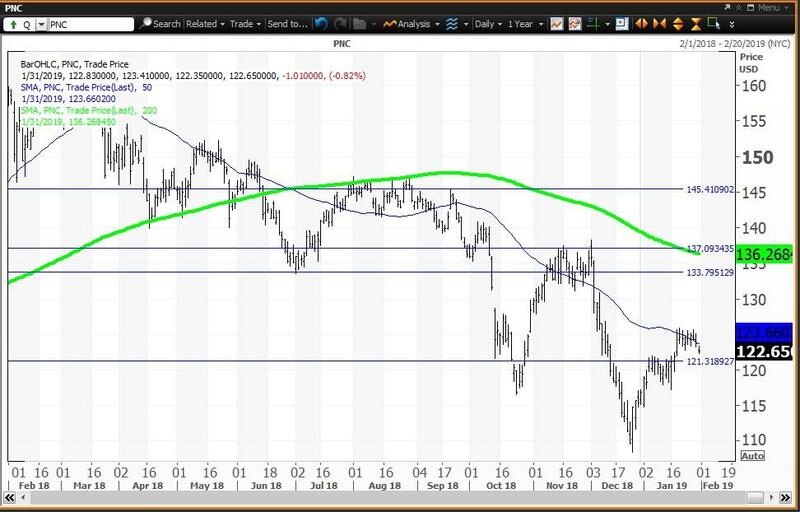 The daily chart for PNC shows that the stock ended 2018 at $116.91, which was the input to my proprietary analytics. This resulted in four horizontal lines that are my monthly value level at $121.31, my annual and semiannual pivots at $133.76 and $137.08, respectively, and my quarterly risky level at $145.38. Notice how the stock stalled just above my monthly value level at $121.31. The daily chart for STI shows that the stock ended 2018 at $50.44, which was the input to my proprietary analytics. 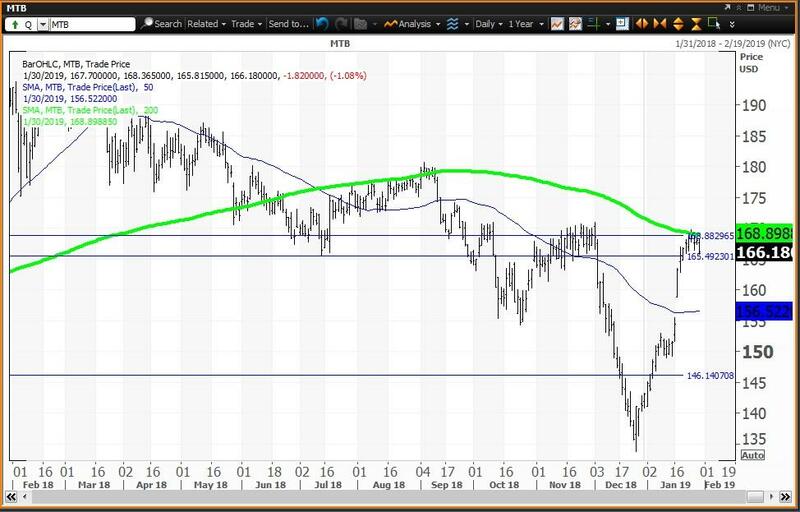 This resulted in four horizontal lines that are my annual value level at $56.69, my monthly and semiannual pivots at $60.35 and $62.54, respectively, and my quarterly risky level at $64.73. Notice how the stock stalled between my monthly and semiannual pivots at $60.35 and $62.45, respectively, where profits should be taken. 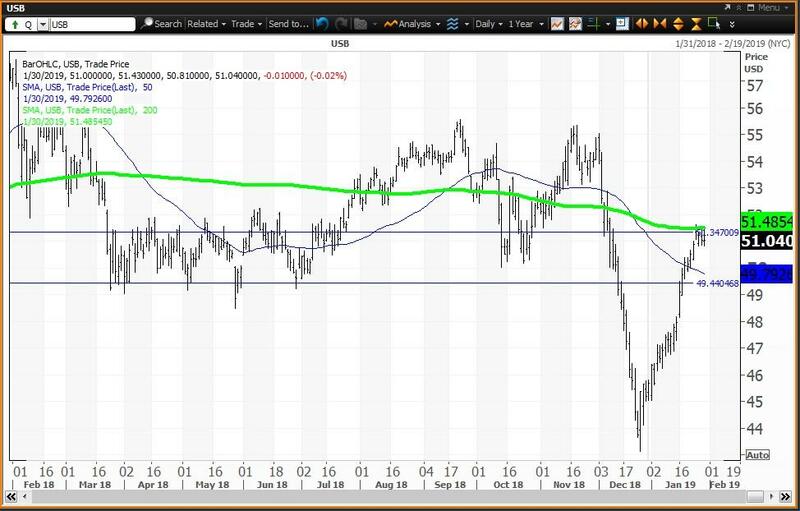 The daily chart for USB shows that the stock ended 2018 at $45.70, which was the input to my proprietary analytics. This resulted in two horizontal lines. The first line represents my semiannual and quarterly value levels at $49.43 and $49.81, respectively. My monthly pivot is $51.34, with my annual risky level above the chart at $58.22. Note how the stock failed at its 200-day simple moving average at $51.49 for four days in a row. The high of $51.63 on Jan. 25 was a test of my monthly pivot at $51.35 and the 200-day SMA at $51.63 where profits should be taken.